A London housing activist and key figure in the Focus E15 campaign has been arrested by police on suspicion of squatting after occupying a council flat in protest at the eviction of its tenants last month. Jasmin Stone, 20, was released on bail after officers from Scotland Yard and Newham Council raided the two-bedroom flat in Kerrison Road, Stratford. Stone is one of the leaders of Focus E15, a prominent housing campaign group started by young mothers after they were served eviction notices in September 2013. The activists are protesting against the eviction of Jane Wood, 45, and her 14-year-old daughter last month. Wood, who has suffered from mental health problems, lost her eligibility for benefits following a review. A spokesman for Scotland Yard said: “A 20-year-old woman was arrested on Monday 13 April at an address on Kerrison Road, E15, on suspicion of squatting in a residential building. According to Focus E15, the occupation of Wood’s flat began on Saturday. The organization posted on its Facebook page on Monday: “URGENT Jasmin Stone has been arrested whilst defending Jane's house as she went to a council meeting. The group reports Stone was held at Waltham Forest borough-based Custody Centre in Boreham Close before being released on police bail. 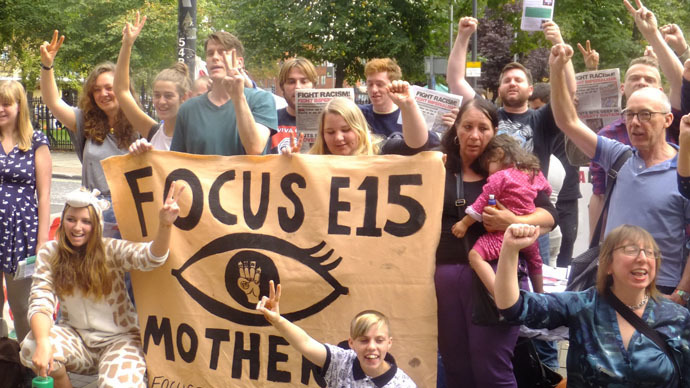 Many of Focus E15’s members are single mothers who became politically active after they were threatened with eviction from a homeless shelter in Newham, East London. It made national headlines last October when it took over a group of homes scheduled for demolition. Online magazine the Londonist visited the Newham council flats due to be demolished and reported that contrary to the government’s descriptions they were in a good, habitable condition. The magazine went on to say the flats would make a “decent home” for anyone. Eileen Short, of Defend Council Housing, told RT it was wrong to arrest Jasmin Stone. “With 5 million people on housing waiting lists, evictions and overcrowding at record levels and housing costing more than ever before, it's the people driving our housing policy that should be locked up!” said Short. “We can ensure homes for all who need them by investing in a new generation of energy efficient council homes. Short said as the housing crisis mounts, the movement is turning to the mass rent strikes, occupations and protests of earlier generations who fought for council housing. “Jasmin is part of a new housing movement, inspiring resistance and action across Britain. They can't lock us all up!” she added.